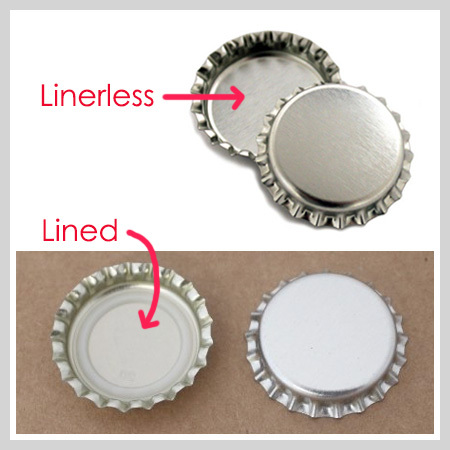 Our linerless bottle caps are authentic food grade bottle caps manufactured for bottling. However our relationship with the manufacturer allows us to purchase them before the rubber liners are added. To put it simply.. for craft and jewelry making! In creating craft, jewelry and promotional/fundraising items the liner just gets in the way. Some craft and jewelry makers boil their caps and then peel each liner out by hand. Taking the liner out creates a much cleaner finished item, but is quite a process. 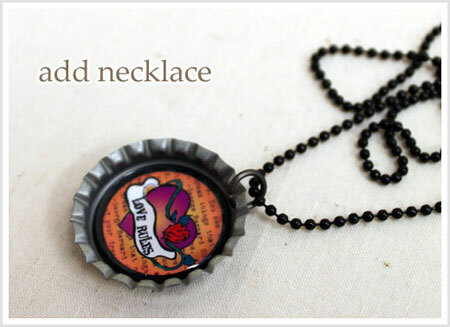 We are able to purchase huge quantities of bottle caps with the liner left off in the manufacturing process, allowing us to pass on a high quality, low cost product to craft and jewelry makers as well as small business owners. Bottle Cap Co bottle caps are made from steel. Bottle Cap Co bottle caps have been tested and have less than 100 parts per million lead content. Our bottle caps meet the new CPSC (Consumer Product Safety Commission) standards for lead content.Click Here to view our Certificate of CPSC Compliance. All BottleCapCo bottle caps have been painted and sealed at the factory. All BottleCapCo bottle caps have been sealed at the factory, the paint will not scratch off the bottle cap unless you take a hard sharp object to it. All of our new bottle caps are manufactured without the rubber liner. The only bottle caps that Bottle Cap Co. carries that have a liner are some of our Vintage Bottle Caps. All of our bottle caps are sealed on both sides with a food grade lacquer. This keeps the bottle caps from rusting or corroding, yet still safe for your customers and your children. In your wood products you had printable travel, phrases, etc squares, but the site would not accept my 3 quantity for buy 2 get 1 etc... can you tell ell me what I might be doing?